Hey it’s been a while since we’ve asked you guys to tell your friends about our comic! Believe it or not, we’re not internet famous, and can use all the publicity we can get still. GET THE WORD OUT. I did not change Slice’s font to make it more distinct from Floyd’s. We have always been at war with Eurasia. I find it funny that you support the Ministry of Truth’s message being such an advocate of Linguistics. Also, I think Slice is my favorite. 1984 is a very interesting novel linguistically… and still remains the most soul-crushing book I have ever read. We’re getting closer and closer to newspeak all the time, y’know? Double plus ungood. Remember, I did an AcDec speech about that when I was a junior? It was no Apostrophe Avengers but it was still pretty good. I think my biggest mistake was reading Brave New World right after reading that one. *Shiver* Makes me cringe thinking about it. I do remember that speech. I haha’d so much at it too. I like Brave New World a lot better, actually. It’s still terrible to imagine a future like that, but at least in Huxley’s novel there was hope. Some of the characters got out with their free thought intact, unlike Winston in 1984.
i will again attempt to get u guys fans…..it has been basically me, hanged man, thaumaturge, and a few others..
and the guy in the cloak took that long to approach the door?? Man, he was on a hill and he had to pause there dramatically for a while. Cut him some slack. He likes to take some time to smell/kill the roses. Don’t get me wrong, I love deviantArt and I know a lot of good people there, and I’ve been there for like six years. I just go through periods of being less active because of school and work and other duties, but when I have time I try my best to keep up with my friends there. If you post something on dA I will certainly see it. Both. Although I wouldn’t say “unmatched,” there is Derk. And he loves Floyd, and he loves Ecta… he’s a sweetie. I just found this comic yesterday and spent a good portion of yesterday and today catching up with it. My boss would be so mad if she found out. Keep up the great work. Just started reading today. I’m really quite liking it so far, especially the relationship between poor Skarva and Lorelei. The art style is also really quite cool, and I love how different fonts are used for dialogue between characters. What race is Floyd supposed to be? 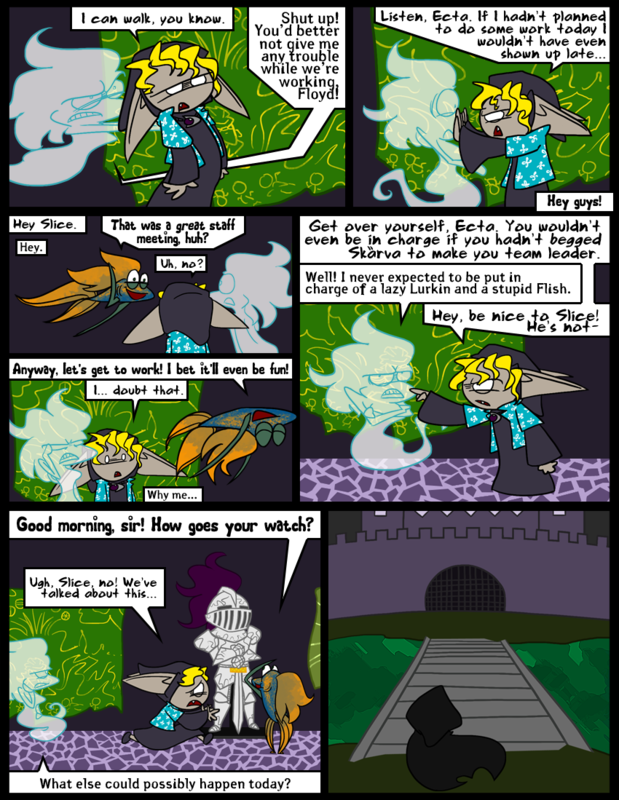 Ecta is obviously a ghost, and Slice is…probably a fish, (why a fish, and particularly this fish who appears to be quite cheerful and crazy, would be considered a valid evil minion, I don’t know), but I really have no idea what Floyd is supposed to be. Barty! *hug* I wondered if my sudden return to the RWP (for how long, I have no idea) might have triggered a new face or two around here. Anyway, thank you very much :3 Floyd is a Lurkin, one of the more prominent races of Idenau. They are innately magical and can respawn, and many of them work for Skärva as they did his father – despite being accursed humans themselves, the Skärvas are shunned by the humans of Idenau for reasons you’ll find out eventually, but most of the other races – Demons, Lurkins, Flish, what have you, don’t really care about humans and their prejudices. And ghosts were often humans, but the humans who end up as ghosts tend to be atypical in the first place. Heheheh. Flish are meant to be like Skärva’s Goombas. You wonder why so many of these seemingly useless things are sent out to fight, yet, they seem all too willing, so why not? They are based on betta fish however, as those can get quite vicious. Haha, yeah, I would’ve seen the topic leading to it earlier had I been active when the topic was created…only reason I found it is because you made a post recently and I stalked your latest posts, (one of which lead to Twilight’s topic for this). Also, yeah…I’ve deviated a few times where I wear something different for a while, but I always come back to Eyrie. Out of curiosity, who’s writing the actual story? Sliiice! I love him already. I’m dying to know who this cloaked person is at the door!